IPL 2019: The yellow camp is in good spirits midway through the tournament. IPL 2019: CSK skipper MS Dhoni was in a mood to play pranks after Chennai beat KKR to go top of the table. Dhoni was seen playing around with Imran Tahir’s son during his birthday celebrations after CSK reached Jaipur for their next fixture. Tahir’s son, unlike his father, looked shy and in order to make him feel comfortable, Dhoni got playful. This is not the first time that Dhoni has regaled the super cubs at CSK. 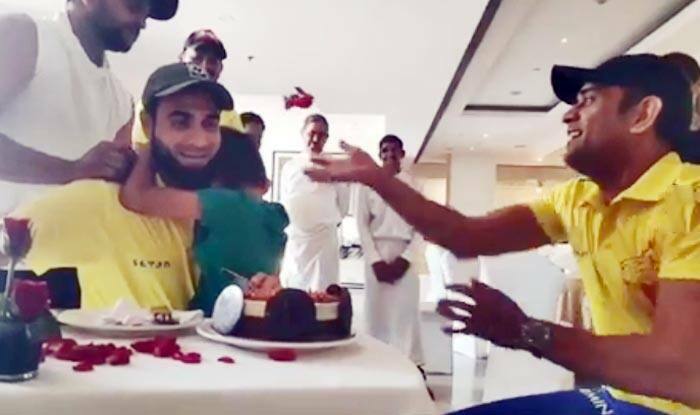 Dhoni threw flowers on Tahir’s son as he looked away in his father’s lap. “It’s Jr. Parasakthi Express’ birthday and our little cub is a lil’ too shy today! Here’s to many more running races and super fast airplanes, Gybsy,” the post was shared by CSK and this is what it read.